Soul Searcher takes place in a world where magic is as common as breathing, but a soul transfer goes terribly wrong. This is an intriguing setup to an epic fantasy novel. What was your moral goal when writing this novel and do you feel you’ve achieved it? I wrote a good portion of Soul Searcher while I was working as an Adult Felony Probation Officer. Working in such a position gives a person the opportunity to experience many different views of why we are here, in this life. One such outlook was the need to obtain immediate gratification without forethought of the moral costs or consequences: addiction. Another outlook was the sometimes jaded, superior opinion many in the field get when working in that environment. Mordeth was addicted to the power of his position and the euphoria of the magical weave, and he felt he was justified in what he was doing. This addiction made him impatient, and his superiority caused him to other the criminals, to make them less than he. Mordeth’s straying from the moral code of society led to his downfall and to wasted years. He forgot he was supposed to serve instead of being served. Rork is an intriguing character that knows little about his past. What were some of the trials that you felt were important to highlight the characters development? First and foremost, Rork felt he needed no one. That is false. No matter how strong or independent, we all need someone. Everyone has unique traits and skills, but no one person is perfect. We all have weaknesses, and Rork sure had his. In discovering friendship, Rork improved his place in the world and brightened his existence. Also, Rork lacked faith in a power higher. He needed to learn to believe and have faith; his ax, Retorter, could not hack its way through everything. In the end, that was his redemption. How did you balance magic and its use throughout the story to keep it believable? I wanted magic to be addictive, to siphon life with each usage. It may cost seconds, minutes, hours, days or years of life with the depth of the draw. A Mage-Lord could instantly light a torch with a wave of his hand and only lose seconds of his life–about the same amount of time it would have taken to physically light it– or she could wield destructive power and lose years of life. A mage would have to balance his or her current need with the cost and danger, because accepting the weave is addicting and dangerous. What is the next book that you’re working on and when can your fans expect it out? I am working on Shadow Court. Rork’s redemption is complete, but his atonement is ongoing. Rork has to face all he did as Mordeth, and that man’s sins are far reaching. Shadow Court will be out January 2017. 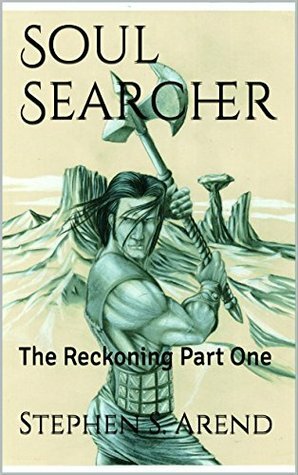 Soul Searcher: The Reckoning details the journey of one man, Rork, as he strives to find his past and answers to the strange memories and images which have plagued him for the past ten years. In making this journey, he will discover who he really is…and was. Along the way, Rork gathers to his side an enigmatic forester with ties to a long-forgotten race, that young man’s secret protector, and a boisterous islander with pride as large as the open canyon country. In the end, Rork finds himself torn between what he must do for himself and what he can do for others around him, for he learns of friendship and caring, and that it hard for a man with only half a soul. The past cannot be changed, and for some, the reality of that may prove too much to accept.